A company run by Divers for Divers! Freedom Scuba USA is a PADI dive shop located just outside of Syracuse, NY. We pride ourselves on making a connection with each student to create a more meaningful educational experience. We keep our classes small in order to give each and every student the attention they deserve and need. Our company can help you start diving, continue your diving education, organize your travel needs and help you with product selection. We are an authorized dealer for Tusa, Tilos, Waterproof wetsuits, Mares, UK underwater lights, Intova Cameras, and Sealife cameras to name a few. Check out our Gear or contact us for any of your scuba diving needs! We run the largest Charter Boat on the US side of the St. Lawrence Seaway. With more than 30 years of experience and over 5,000 dives to his credit, Carl Sanfilippo is one of the most respected divers in Central New York. His passion for diving extends into his classrooms, where he still enjoys the thrill of watching first time divers begin their love affair with the open water. A PADI Master Instructor, Sanfilippo has been privileged to certify hundreds of divers at all levels of diving. As a 42 year educator and 34 year head football coach, a person's safety and well being are the most important components in teaching you to dive. You always come first at Freedom Scuba USA. He will be more than happy to get in the water with you. 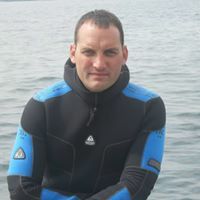 Scott has been with Freedoms Scuba since the move to the Thousand Islands in 2010. Scott is an insured Divemaster with 100's of dives under his belt. Scott enjoys the wrecks of the St. Lawrence Seaway, you can always find him exploring for new things to show students. Scott is also taking the USCG Captain's Course this winter. If you want to dive just ask him, he is ready to dive all the time. Dana started diving in 2003. Since then he has continued to dive, learn, and train with Freedom Scuba USA to his current status of Divemaster. As a high school physical education teacher he enjoys watching people fall in love with a new lifetime activity. Dana also loves the adventure, excitement, and friendships that diving provides. He'd love to see you on our dive boat, The Arrow this summer. Pete is a PADI Instructor that joined the crew last year. Pete enjoys teaching new students, and diving the Seaway. Pete's long range goals are to be in warm waters year round. You will see Pete in the pool and on the dive boat. Pete fits right in with the crew. He loves to dive. Jody has been with Freedom Scuba USA for 5 years. He lives in Clayton, NY, and has been on the Seaway a good portion of his life. Jody's son's Merritt and Jaden are also PADI Divemasters; and his daughter Kendall was Open Water certified last summer. You will see the entire family on the boat. Like the rest of the crew Jody is a very helpful person that is alsways willing to go for a dive.